I was first introduced to Spasagna from this post on The Country Cook. I googled Spasagna and found the version that I posted last week. We both loved the first version of Baked Spasagna a lot, so I decided to give this version a try. This version uses jarred Alfredo sauce in place of a lot of the cheese in the first version. This was very simple to make and tasted fantastic! This version is easier to lighten up than the original. I used light Alfredo sauce and 2% mozzarella cheese - every little bit helps. This makes a ton and would be perfect for a potluck. I made half of the recipe below and it was easily enough for 5-6 people. We really enjoyed this Spasagna. I'm not sure which version is better! In large bowl, stir together Alfredo sauce, mozzarella, milk, and Italian seasoning. Add spaghetti and toss until well coated. Pour spaghetti mixture into 9x13 pan lightly sprayed with cooking spray. 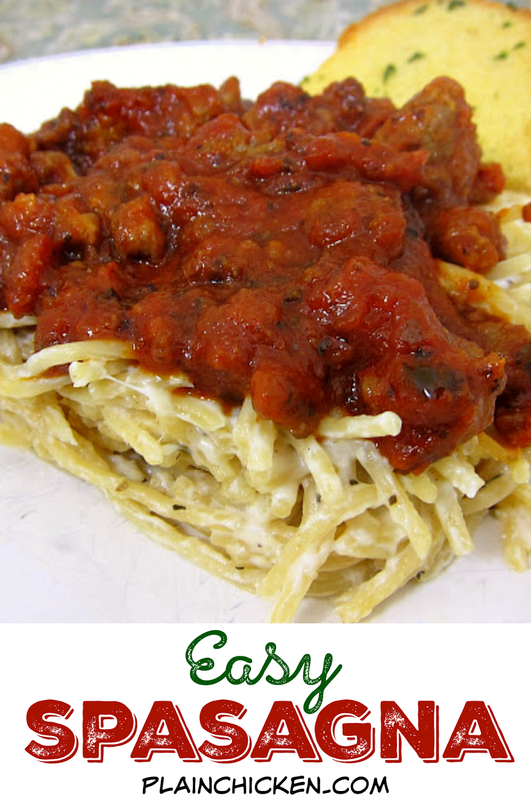 Top spaghetti with Parmesan cheese. Cover dish aluminum foil and bake 30 minutes. While pasta is baking, prepare meat sauce. Brown Italian sausage in skillet. Drain and return to skillet. Add spaghetti sauce and simmer. Remove pasta from oven. Cut into squares and top with meat sauce. Definitely trying this for dinner one night!! you sure have me craving pasta! This one seems much easier and more affordable... Looking for something to make tonight and I think this is it! Awwww Steph, wow I'm honored! Thank you so much for sharing my recipe. You rock! So, so happy y'all enjoyed this recipe! I've followed your posts for less than a week and already I'm going to have to stop LOL... I'm kidding I promise! Oh my goodness. The Smokehouse Chicken was great and the Spasagna was even better. I love to try new recipes and these were both well written and extreamly tasty!!! Even my husband said they were keepers. OK, I feel like a recipe stalker. I can't stop making your recipes. I used this recipe for the recent Crazy Cooking Challenge. I loved it!! Especially love the semi-homemade twist you did to it. Thanks for sharing and check out the love I gave you when I posted my Easy Spasgna. I've been seeing this all over the web this week and I definitely want to make this saucy, creamy dish. I waited a while to make this and made it last night. It was far more economical to make than the other one... and very delicious. In fact, I just had leftovers for lunch today! This recipe is amazing. The white pasta sauce is so creamy and decadent. Leftovers are just as good! Sorry, I know this is an older post, but I'm wondering if there's a particular brand of sauce you recommend. I've tried one a while ago and didn't like it all. I'd love a recommendation! I love Trader Joe’s Roasted Garlic Marinara (green label) or La Famiglia Del Grosso pasta sauces. Enjoy!